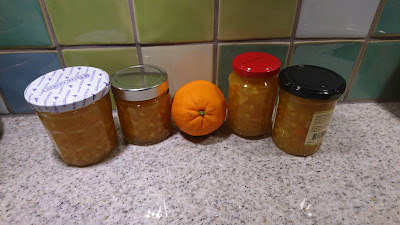 At the start of this week-end I brought a small box of organic oranges, so I could make some experiments various orange jams in line with my theme for February. The first of orange jam is a twist to this recipe on Karen-Marie's lemon jam just replacing the lemons with orange, and thereby making my own orange jam. I was lucky with oranges, which I brought, as they did not contains any seeds, so I did not have to spend time om removing these orange seeds, while I was cutting the oranges. It takes some time to make this jam, as the orange pieces have to soak cold in water for 24 hours, before it turned into jam. After the soaking of the oranges in water, I decided to taste, how acidic the orange mixture seamed. As I found the mixture not to be acidic enough in taste, I decided to add in a small amount of white wine vinegar to get more acidity. The level of acidity plays a crucial role for the setting of the final jam. If the jam is not acidic enough, the jam will NOT set/make a gelled texture. As citrus fruit is high in natural pectin it is possible to a gelled jam, if the amount of sugar is high enough (minimum 65% solids combined with low pH, high level of acidity). I will be selling some of the jam jars at work to my colleagues, as I cannot eat 6-8 glasses of jam within reasonable time. And as usual I will donated the money to charity. From sale of various jams in November and December last year (quince jam, apple jam with vanilla & tomato & chilli jam) it was possible to donate 380 DKK to Julemærkehjemmene. Kirsten's orange jam: 8-10 glasses. Do the cutting of the oranges on a chopping board, so all the orange juice can be collected and used in the jam mixture. Cut the oranges into smaller boat shapes. Afterwards slice the oranges "boats" into thin slices. Use a shape knife for all this cutting. Remove the orange seeds during the coating process, as they will give more bitterness in the final jam. 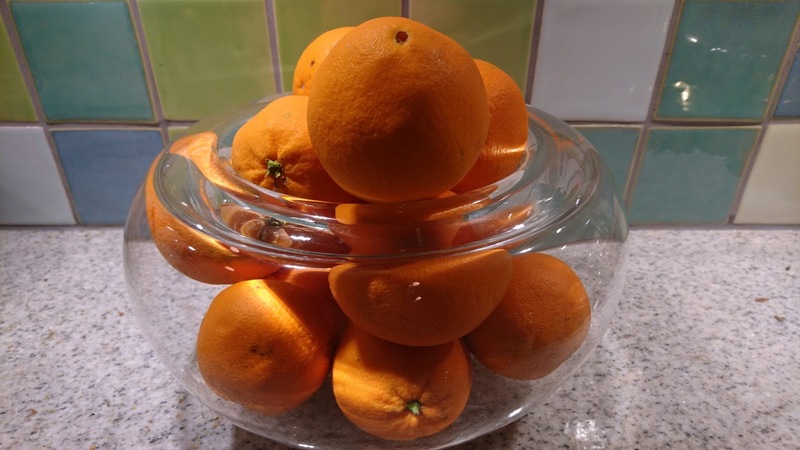 Orange slices and lemon juice in added into a medium-large mixing bowl. Pour the water into the lemon mixture. Store the orange mixture cold in the refrigerator for 24 hours. Pour the orange mixture into a large cooking pot. Taste for the overall acidity. Adjust with white wine vinegar to get more acidity, as this has an impact on the gelling of the jam. 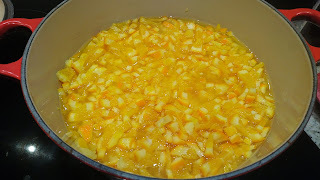 Let the orange mixture simmer gentle for 1 hour without the lid on the cooking pot. Prepare the jam jars by filling them up with the boiling water. If the orange slices appear too thick, you could consider to blend the orange mixture, before the addition of the sugar. After 1 hours boiling add in the sugar. Bring the orange jam to a rolling boil and boil hard until the setting point is reached. Stir the jam frequently. Test of set after 4-5 minutes using the flake test.